BroadwayBox and photographer Jenny Anderson launch a new photo and interview series this fall spotlighting 10 current Broadway musical replacement stars whose performances left us stunned in our seats! The illustrious group (ranging from title stars to scene-stealing co-stars) was shot at the beautiful West Village restaurant The Spaniard. After highlighting leading lady Mallory Bechtel, today we turn our attention to another remarkable Dear Evan Hansen star, Taylor Trensch. The young stage star has become known in NYC for delivering knockout performances, ranging from a LOL scene-stealing run as Barnaby Tucker in Hello, Dolly! to his devastating and fragile Christopher Boone in The Curious Incident of the Dog in the Night-Time. As the title character in Dear Evan Hansen, Taylor strikes a chord. His raw, realistic performance of an anxious teen leaves audiences crying, right out of the gate. It's a triumph. 1. Tell me about your journey with Dear Evan Hansen, from your introduction to the musical to getting the offer to take over as Evan. Michael Greif [director] asked me to see it, and so I went to go see the full original Broadway company, and I melted into my chair and wept for a million years. After I saw it, he asked me to audition. I came in and met the entire creative team and sang some songs for them. The next day, I got a phone call asking me to join, which was bonkers. 2. Was it a trip to jump so quickly from the classic Jerry Herman musical comedy Hello, Dolly! into this modern, heartbreaking musical drama? Completely. But strangely, Hello, Dolly! was scarier territory for me. I had never done a broad farce or anything like an old-fashioned Broadway musical. So, that was terrifying. I think in a way actually jumping in with Dear Evan Hansen was a relief—even though it's this monstrous beast of a role. The emotional territory was something I had trodden before. 3. What do you feel was unique about your replacement process? It was mighty long. [The show] knew that I was going to be re-reviewed, so I think they really took their time with me. When I got the job, I had several months of rehearsal time with the writers and with Michael. It was really such a luxury because usually as a replacement you get two weeks with the stage manager and then they push you out there and hope for the best. 4. Once you found out you were taking on this role, how did you go about building your Evan? My main strategy was to push it out of my mind for a little bit and not to focus on it too much until I absolutely had to. I wanted to focus on finishing Hello, Dolly! and not psych myself out, because I was constantly being told how hard it was, how hard the show was, and how much people loved Ben's performance. Oh my gosh. The replacement cast of Next to Normal, starring Marin Mazzie, Jason Danieley, and Meghann Fahy. I had seen the show before and had a wonderful time, but seeing that cast knocked me to the ground. That replacement cast of Next to Normal was artistry on another level. 6. Finish this thought for me: My Evan Hansen is ____. Simple. My Evan Hansen is simple and grounded. I wanted the writing to take center stage, and I wanted it to feel like we were an ensemble of actors doing a play together. 7. Tell me about the special dynamic between the four professional Evan Hansens (Ben Platt, Noah Galvin, you, and Ben Levi Ross). Do you all have a group text? I don't think we have one that's all four of us, but we do have various pairings. I think Noah, Ben Ross, and I have one; and Noah, Ben Platt and I have one; and Noah, Ben Ross and Ben Platt have one. There're all kind of crazy. Photographed by Jenny Anderson at The Spaniard Restaurant. Hair and makeup by Austin Thornton and Gianna Yanelli. Styling by Jake Sokoloff. Assistant Stylist: Phylicia Pearl Mpasi. Jacket, shirt & pants by Zara, with sneakers by Noah Waxman. 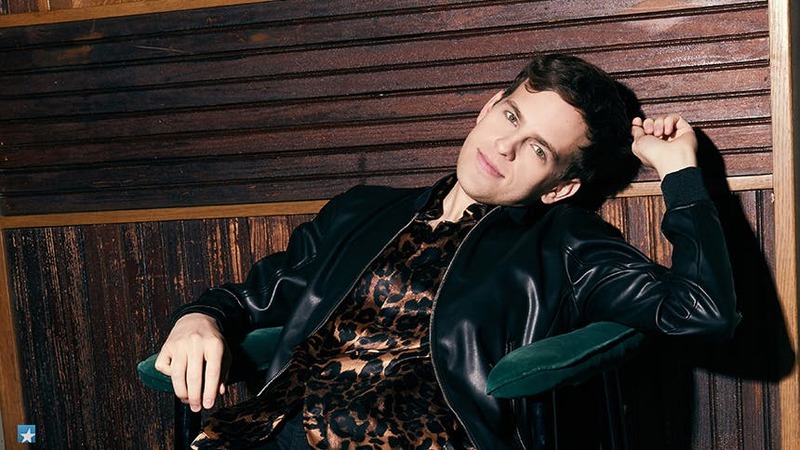 Hurry to see Taylor Trensch as the title character in Dear Evan Hansen at Broadway's Music Box Theatre through January 27, 2019.